Structuring your genealogical research is one of the biggest challenges that amateur genealogists face. Anyone who has been doing research for an extended period knows that notes, records and other documents can quickly pile up. Often times to the point that you can’t make sense of anything you’ve collected and you lose track of what you were trying to answer in the first place. This is why good organizational habits and research fundamentals are so important in genealogy. How can you find answers to your research questions if you’ve lost track of what the question was to begin with? In a sea of post-it notes, how can you find the name of that reference book that you need to go back and analyze for a second time? Bookshelves overload, binders take up an entire wall and books are everywhere in stacks as high as the Eiffel tower. This is not an effective system. Clearly defined goals, research questions, logs, citations, and good notes are the only way to be successful in genealogical research. Whether you are entering this information into family tree software or word processing software, you must prepare for the inevitable information overload! This article will help you understand the fundamentals of organized genealogical research, and give you a simple process to follow for knocking down those stubborn brick walls. Identify your goals. Write them down. Pick one to start. Develop specific research questions that will help you achieve your goal. Pick one to start. Identify and write down (in your research report) what you already know. Identify and write out the initial batch of possible sources to find information that may provide evidence for your research question. Find sources and record information, notes, and analysis in the research report. Add new sources to your list that were suggested by the information and analysis of your initial batch of sources. Create additional research questions (if needed) based on information and analysis of each source. Analyze and correlate information, resolve conflicts and write conclusions – or what’s needed for additional research. Add information to your family tree software. Published with permission from Mark Tucker, the creator of this graphic. The first step in any project is always to identify your goal. What are you trying to accomplish and how do you plan to get there? I think of goals in my research as a set of research questions about a specific family or branch of my family tree. So a goal for me might be something like tracking my McDermott branch back to Ireland. There are a lot of research questions that need to be created to help achieve that goal. While you will eventually have several goals, it’s important to keep focused on one at a time. So figure out what your goal is, write it down, and move onto the next step of identifying what you already know. Start with what you know about the question you’re trying to answer. It isn’t good enough to just type out everything you think you know; you need the records that support what you know. Marriage licenses, birth records, and death certificates are a fundamental part of this. If you have the documents at your fingertips, scan them and enter the information and your analysis into whatever note taking software you use. Research questions are just a query about the information you want to know, and they should be specific. Who were the parents of John McDermott (born ca. 1844) in County Leitrim Ireland and lived in Newark, NJ? What was the maiden name of my 2x Great Grandmother Annie (born 1845) who was the wife of John McDermott and lived in Newark, NJ? What service (if any) did John McDermott, born 1843 and lived in Newark NJ, give to his country during the Civil War? Good research questions have specific, attainable goals with a clear endpoint. Once I find the maiden name of my 2x Great Grandmother Annie, I’ve reached that endpoint and answered the question. How many generations of McDermott’s lived in County Leitrim, Ireland? This is not a good research question. Specific research questions motivate us to find the answers that we are looking for. Breaking the research up into bits and pieces helps it become that much more achievable, and therefore rewarding. Background information to research question. Recap of what research you’ve done so far if multiple research reports exist for the same question. List of sources you plan to consult. Sources (and their citations) you’ve already consulted. Information found in those sources – either abstracted or transcripted. Analysis and correlation of the information. Notes about the actual source and record (physical characteristics such as unreadable handwriting or a bad copy). Instances where no record was found. Log of all your searches (both positive and negative) as well as your research methodolgy and approach to the question. Next actions to take in order to make a sound conclusion. Research reports are a master list of all the research you’ve already performed, and all the research that you intend to perform. At a glance, you should be able to easily pick up where you’ve left off on any branch or family in your tree regardless of how much time has passed. So ask yourself, are the notes you’re creating going to be meaningful to you a year from now? Will they help you pick up on your research and let you instantly see where you left off and what your next steps are? A good research report lends itself to a high-quality report when you are finished. It means easier citations, organization of documents, and reliable sources to support conclusions. Research reports take different forms and styles depending on what your preferences are. You should have a research report for each research question. No genealogical report in the history of man has ever been taken seriously if it didn’t have credible sources and citation of those sources. No matter how dreary it can be creating those citations, it is essential if you want to be taken seriously. Not only that, it helps you and other researchers to locate the source quickly, and efficiently. Sources can appear as footnotes or endnotes in genealogical reports, depending on the audience and format. Every source must have a citation! 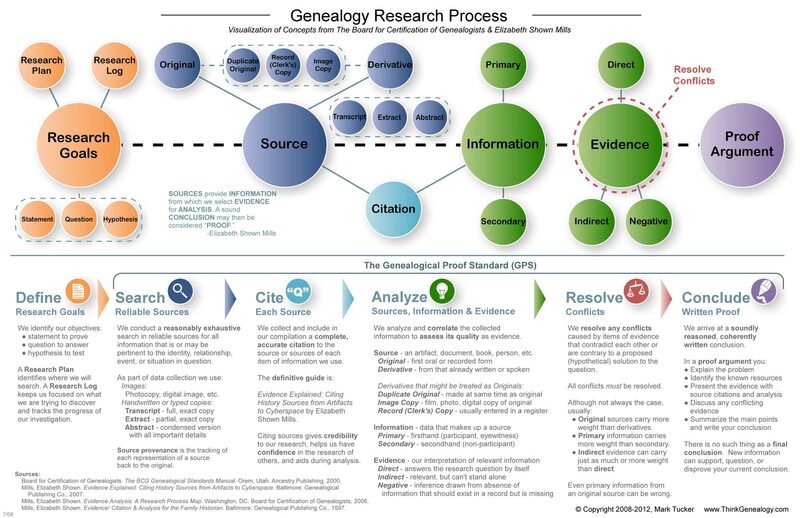 Analyzing and correlating information and evidence sounds very daunting, but really it’s the entire point of genealogical research. It’s typically done in several stages and can take quite a while. The first step is determining whether or not a document falls under the research you’re currently performing. You are determining its relevance and credibility. You are determining the reliability of the source and information, but you’re also comparing it to other sources to see if it contradicts or matches what you already know. Look at the origins of each document, the events, and facts associated with each source, and considering the directness of the evidence. Sometimes it is helpful to take a step back and return to the sources with fresh eyes later on. Most of the resolution of errors and discrepancies are going to occur at this stage because you’ve already re-examined the sources, and documents with a much closer eye. You are going to have to resolve these discrepancies to have a complete, accurate history. In some cases, mentioning the discrepancy in the final report is an excellent way of taking care of minor issues. Major issues will need to be addressed with a formal statement in the report. If there are controversies amongst other researchers, this should also be explored in the document, as well as which outcome you support. You’ve put in the work; now it’s time to show it off in the form of a written conclusion. It is important to point out that the conclusion will directly reflect the goal of the researcher. If it is a conclusion intended only for friends and family, then the tone and overall format may differ from a professional genealogical report. Conclusions should always reflect the standards of the research. Sources, footnotes, and citations should be correctly formatted, accurate, and true. The work should focus on honesty, accuracy, and clear analysis of evidence. It should not contain assumptions, or any of the author’s speculations unless they are supported by credible evidence. Because tracking your sources, creating citations, analyzing information and writing conclusions can be a difficult task, there’s an amazing piece of software that I like to use called Evidentia. Evidentia is a light-weight desktop application that allows you to effectively apply the Genealogical Proof Standard to your research in a way that doesn’t make your head spin. It walks you through adding sources, classifying them, recording the information, classifying the information, creating evidence, classifying evidence, resolving conflicts, and writing conclusions. And because it uses a simple database to record your input, you can quickly generate conclusion statements about any of your research questions. So when my cousin Bill asks me how I know the McDermott’s are from County Leitrim, I can quickly generate a proof statement that includes all of my sources and citations. Really neat stuff. I really can’t recommend this software enough. Click here to get a free trial. If someone who has been researching longer than you offers you new or different information, then you should always be willing to at least give it some attention. You’ll find yourself in this position when looking at other people’s family trees on sites like Ancestry.com, and when communicating with DNA matches. As a general rule of thumb, you need to assume user-generated information like this is not accurate unless you can see the documentation. That is not to say this information is worthless. It provides a ton of clues for you to research and find credible sources. If you’re looking at someone’s public tree or communicating with a DNA match, try to ask where they got certain information or how they arrived at a certain conclusion. One thing that cannot be stressed enough is to be courteous and decent to all other researchers, records office employees, librarians, and anyone else that you might come into contact with during your research. These are the folks that hold key pieces of information that you may need, treat them with respect and they may just help you fill in some major blanks. At the very least, you will make friends with folks who share similar interests with you. Your research should be able to compel others that your conclusions are true and accurate. If there is any flaw in your method that indicates to another researcher that you didn’t fully exhaust all available resources, then they won’t take you seriously, and neither will anyone else. This is another excellent reason why breaking up genealogical research into specific people, or events is a good idea. It is much easier to fully research one individual and exhaust all of those resources then it is to do that for the entire family tree all at once. Most genealogists realize that their research is never fully complete. You can spend the rest of your life researching an entire lineage, but later on there will always be new information, new sources discovered, and new reports by other genealogists that will impact your research. At the end of the day, success in genealogical research is all about knowing fundamentals. One you can master them, you’ll find your mind much less cluttered and you’ll have a much clearer path to knocking down those brick walls!